What is it about our natures that drive us to wanting to have a pet? I would say that it might be because we love the furry & cuddliness of them but that would be one sided. 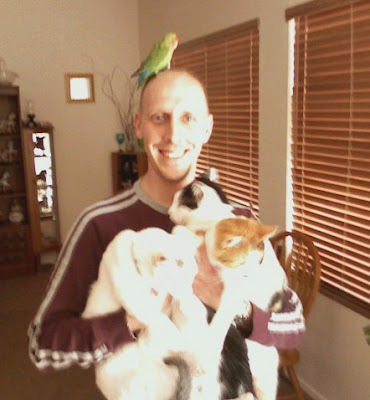 I personally have had birds for pets and they sure aren't furry. I have also had fish for years & they are far from cuddly. Although I've never owned a reptile, they also are neither furry nor cuddly either (well except maybe a snake but then you've got to be careful in knowing the difference between cuddly and strangley). So what is it? I can't speak for the world as I personally know people that don't have any pets & simply think of them as a nuisance & just something else to clean up after. So those types of people aside...I believe it has a lot to do with companionship. A pet needs us as much as we need them. They need us to look after their health, keep them well fed with plenty of water but beyond that...they need our personal touch as much as we need their personal touch. Our friendly canine that lays at our feet & protects us from harm. Our feline friends that curl up on our laps & purr us to sleep when we're not well. Our fine feathered friends that sing to us good morning & pick through our hair keeping us free of pests (although we laugh thinking they are "styling" our hair). The sleek reptilians that watch us & provide us with all kinds of new knowledge. Even those 6, 8 & multi legs critters that are just fascinating in many ways. All these pets, in their own ways, give us much joy & keep us from feeling "alone". Even in the times when we are mad at the world & hate everyone in it, we still will turn to our pets in a much kinder manner. Now, I know that there are people out there that just don't get that. They use pets as money makers, or as punching & kicking bags, or even for sick amusement. As a member of the ASPCA, I will go out of my way to stop any form of animal cruelty & have no problem turning someone in for abuse of any animal. It's pretty pathetic to me to take out any aggression on those that can't fight back, especially animals that have nothing to do with it in the first place. That also goes for those that don't have their pets fixed. It may not be cheap but if that's your answer, you don't need to have the pet in the first place. So next time you look into your pet's eyes, take a moment to see what they see. I know that there are those rogue pets that go bad but for the majority of them...they simply love you. Each in their own way but deeply & preciously. Every time I'm petting my cats or playing with the family pooch or whistling songs with my bird or even gazing into my salt water aquarium, I can see & feel something special from each of them. I know for a fact that they have enhanced my life. I hope that you all have a special pet to lavish love & affection on, or if you are like me...several pets to lavishly love!